Burnt Head, Newfoundland is a historic village (now part of the Town of Cupids) situated on the North West coast of Conception Bay. Burnt Head is approximately 2 miles from ‘The Dock’ by boat. 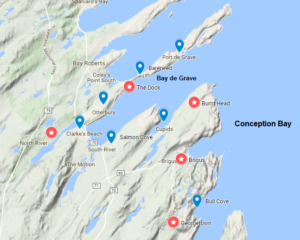 Re above: On August 21, 1804, in an effort to help avoid frequent disputes regarding possession and rights of Fishing Rooms, Beaches, Flakes and land, Governor Erasmus Gower issued an order directing his Surrogates around the Island of Newfoundland to take an exact account of all Fishing Rooms, Wharves, Beaches, Flakes, etc… within 200 yards from the High Water Mark and register them in a book. The claims of every Merchant, Planter, and Boat Keeper to the land he occupied were to be clearly defined. This official Register of Fishing Rooms was to be admitted as evidence in all land claim disputes. Isaac’s grant for Burnt Head was dated four years after Philip Noel (Newell) of ‘The Dock’ and both families were identified as Noel in the 1805 survey but in later records are recorded as Newell. My family tradition suggest that the Newells of ‘The Dock’ are related to the Newells of Burnt Head and given the proximity in time and space of Philip and Isaac establishing their plantations this would seem logical; perhaps they were brothers or cousins. The next record we have for Isaac comes from a survey of the inhabitants of Conception Bay conducted in 1817. Burnt Head was included with Cupids in this survey (see below). At the time of this survey Isaac was well established with a wife, five children and one man servant. Planters like Isaac generally employed servants to assist with the fishery. In the survey he is described as “Distressed” which is not surprising since the previous year 1816 (known as the Year without Summer in New England) was an especially difficult time (noted for a poor fishery and riots in St. John’s). Assuming that Isaac was at least 20 at the time of his grant in 1790 then he would have been 47 or older in 1817. Isaac’s oldest children were likely born at the time of the survey in 1805 (children were not recorded in 1805) and by 1817 would have been old enough to help with the fishery which may be why he only had one servant. A voters list compiled in 1835 provides our next snapshot of the residents of Burnt Head. This list has two Newells (William and George) listed for Burnt Head. This same Voters List for ‘The Dock’ lists James and John Newell who were the sons of Philip so these are likely sons of Isaac (among the 5 children noted in 1817). Assuming that Issac was at least 20 in 1790 would have made him over 65 in 1835 so we can assume he was no longer alive or perhaps living with one of his children. If William and George were born prior to 1805 then they would be in their thirties. Based on the previous assumptions regarding the age of William and George (1835 voters list) we can assume that Isaac, John an Robert were their sons and George might be either a son or possibly the George from 1835. Note John 1894-97 and 1898 is likely the John listed in 1871 (1832-1904) while 1898 John Jr. likely John of WWI born 1876 and married 1897.